A winner is one who accepts his failures and mistakes, picks up the pieces, and continues. HTC has learnt from their mistakes and decided to focus on few phones instead of flooding the market with smartphones. I can say the HTC One series rise from the ashes. At MWC, The Taiwanese manufacturer released the HTC One Series: HTC One X, One S and One V which stole all the limelight of the show. The HTC One Series were show show stoppers. With HTC One Series smartphones, the company want its empire back from Samsung. Among three, the HTC One X is the most powerful smartphone and I’m going to review Indian version of HTC One X.
HTC One X has minimalist body design, made up with lightweight polycarbonate at back and Gorilla Glass at front. The Phone is 8.9mm in depth and weight in at just 130g which is very low as compare to other big brothers. The low weight is because of polycarbonate but in feel it looks like an ordinary plastic. I’ve Brown grey version of the phone and it looks dull as compared to white one but white one caches dust too often that’s why I choose Brown grey. The Camera surrounded by an attractive silver ring and small but powerful LED flash right next to it. Overall the back looks beautiful because of the camera ring. When you turn the phone than you get the real beauty of HTC One X. The One X has 4.7-inch HD Super LCD2 display with 720 x 1280 pixel resolution and it has curvy design. The company adopts curve design from the Galaxy nexus and you can top and bottom edges are curved up. Below the display, there is three buttons (Back, Home and Recent apps) but unlike the Samsung Galaxy Nexus, the buttons are capacitive and not a part of the display. You won’t face any problem with the buttons unlike you used Galaxy Nexus. Above the display, you’ll find the HTC logo in the middle, 1.3 megapixel front facing camera on right, the proximity and ambient light sensors to the left of the earpiece. There’s tiny LED under the earpiece grille. The red LED turn green when fully charged and blink green for notifications. The left side of the HTC One X has microUSB port which is used for charging and data transfers. On the right side there is volume rocker. Remember there is no dedicated camera button which is disappoint many of us. At the top, you’ll find 3.5mm audio jack, a microphone pinhole, and the Power/Lock key which I found very difficult to press specially when you’re hold the phone with one hand. The best display I’ve ever seen on phone. The 4.7-inch Super LCD2 touch screen is bright, clear and sharp. The One X display is large and brightness is too good that you can easily view the display in the direct sun light without any difficulties. Super LCD 2 offers some excellent viewing angles, you can read the text clearly by adjusting angle between display and your eyes. The corning gorilla glass save the display from external damage. HTC One X runs on latest Android flavor, also known as Ice Cream Sandwich. Our One X has Android 4.0.3 and Sense 4.0 UI. Galaxy Nexus was the first Android 4.0 ICS device but India due to delay in launch of Galaxy Nexus, the HTC One X is the country first Ice Cream Sandwich phone. UI is the most important part in any phone because phone performance and user interaction depends on UI. 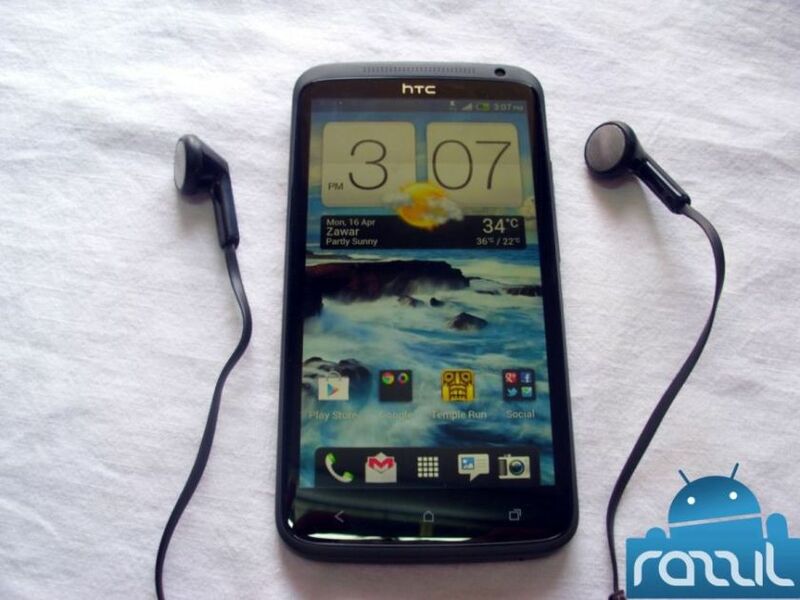 The HTC listen the user feedback and comes with improved HTC Sense called HTC Sense 4.0. In many ways Sense 4.0 behave as ICS UI. The company has mix the ICS and Sense in One X which brings many ICS features to Sense like Task Switcher, Resizable Widgets, Folder Widget, Face unlock etc. The lockscreen has been further improved and its better than any other smartphone out there. The lockscreen has four shortcuts and a ring at the bottom. You can drag the shortcuts into the ring to open that app directly. dragging the ring on Center will unlock the phone. HTC add further enhancements with eight different lock screens which comes preinstalled in One X. You can customize the lockscreen from the Personalize menu. The task switcher in One X cover the entire scree and it show the thumbnail of the app running on it. You can kill any apps by swiping up from the task switcher, task switcher is good but I personally feel that Galaxy Nexus has better task switcher. Creating folder on homescreen is much easier than ICS, drag and drop will add/remove the app to/from the folders. Scrolling the screen by swiping left-right gives you 3D cube animation. Sense 4.0 comes with plenty of widgets to add on homescreen but customization of the widget is very easy, just push will add/remove the widget from the screen. Sense 4.0 includes a revamped browser and keyboard but I didn’t use it and don’t wanna use. I prefer Chrome beta and Swiftkey and I suggest you to go with these apps. 25 GB of Dropbox storage is definitely a good move but as HTC advertise that they heavily integrated Dropbox with sense but I didn’t notice any thing you can get similar feature in any other Android phone. When it comes to pre-loaded apps, you’ll get usual Android apps like Gmail, Google Talk, maps and Play market. other than these HTC includes many other apps to target Indian users. you will find 7 digital music store,PDFViewer, Polaris Office, Saavn, SoundHound, Bollywood Hungama, ebuddy XMS and TuneIn Radio. Overall Sense 4.0 is the huge improvement over the previous version, the new version is light and cuts down many crap animations. In many area Sense 4.0 is better than ICS. Camera is one of the key features of the phone and HTC promoting the One X camera as one of its best camera available in the smartphone and so far they’re right about the camera. Camera pack with 8 MP camera with auto focus, smart LED flash, BSI sensor, F2.0 aperture, 28mm lens, 1080p HD Video recording. The hardware of the camera comes with many hefty features which overall improve the overall camera performance without using an external app. Using HTC One X camera app, we can capture photo instantly with no delay, capture a photo in the midst of recording HD video, smart flash, video stabilization, capture multiple photos in continuous shooting mode upto 99 frames, slow motion video capture and playback, capture portrait and panorama view. Camera can be launched by the icon on lockscreen or home screen. There is no dedicated camera button, you’ve to use soft key to capture photos. I’m disappointed with that but I’ve learned to live with it. Lets talk about the camera UI, well the camera UI is simple and same for both camera and video. HTC combined photo and video modes into a single viewfinder. You can capture photo and record video from same screen. You feel delighted to have both modes at the same time. You can take shots by pressing shutter button and record video by pressing the video button. The right-hand side features the Effects button, Shutter Key, camcorder record key and gallery shortcut that shows the last photo taken. The left-hand side has flash setting toggle, general settings and shot mode. The HTC One X camera comes with dedicated processor chip called ImageSense. The chip handles all on-board processing of pictures which takes off all the load from CPU. The BSI sensor with F2.0 aperture and 28mm lens allow you to capture better photos in low-light. The Camera comes with bund of filter effects just like Instagram. HTC has included the following filters: Distortion, Depth of Field, Vignette, Dots, Mono, Country, Vintage, Vintage Warm, Vintage Cold, Sepia, Negative, Grayscale, Solarize, Posterize and Aqua. To be honest, I’ve less knowledge in Music, still I’m trying my best to write this part. I found Audio quality on One X is superb. The One X comes loaded with many music app on the phone, SoundHound, TuneIn Radio, 7digital and Saavn(Spotify for India, available for Indian version only). The One X comes with earphone that deliver the clear sound. HTC One X offer beats Audio but unfortunately to experience full Beats Audio you’ve to buy Beats Audio headphones worth Rs. 2000. If you’re music fan than I recommend you to buy Beats headphone. In Now Playing Window, You’ve Music Control Buttons like Play/Pause, Next Track, Previous Track, Shuffle and Repeat Buttons. Other than controlling your music, you can perform many action from Now Playing window itself, you can add music to playlist, set as ringtone, Album details or Share the music with your friends. In Actionbar you’ve two buttons: ‘Get info’ and ‘Menu’ buttons. ‘Get info’ use to identify the music playing around you. From Menu buttons, you can ‘update album art’ of current track, ‘Sound enhancer’, add it to queue and select remote players. HTC One X comes with 1800 mAh battery and capable to power One X for a day. The Mileage of the phone depends on how hard you’re using your phone. While travelling I push my phone to run for 24+ hours in which I disabled the GPS, lower the brightness and stop background sync ( Exclude pushmail). While in normal use i was getting 10-14 hours of battery life where I mostly used internet apps and camera. HTC pushed a software update in which they fixed the battery life but at the time of writing I didn’t get any updates. The phone is extremely powerful to play any games. I’ve played FLCommando, GTA III and Shadowgun THD (Only for NVIDIA Tegra 3 Powered Devices). All the games run super smoothly without any lag. The display slight heated up while games. One more problem occur while playing Shadowgun is that HTC Sense crashed in middle of the game but the crashed didn’t affect the performance of game. If you’re gamer than HTC One X is perfect device for you, the graphics of the games are incredibly sharp. HTC One X Blown away all the competitor in the Benchmark test. The HTC One X scores 4994 almost close to 5000. In benchmark result HTC One X beats other device like Samsung Galaxy Tab, Galaxy Nexus and Nexus S by huge margin. No doubt HTC One X is best Android phone available in the current Market. The phone is great by both hardware and software, Awesome build quality, Powerful camera, ICS with Sense 4.0 makes this phone a perfect beauty. The phone has been slightly over priced but you can find the good deal in your nearest local dealer. Today HTC pushed out the new update which fixed the screen flickering issue and improved the battery life. Screen flickering did occur on my device only few people got affected but good news is that HTC replaced the device with new one. The Beauty meet with Power, the quad-core inside the phone finished the any task in seconds without any lag while Sense 4.0 improve the productivity which you can’t find in Vanilla UI. I think Sense 4.0 still need improvement but if we compare to previous version this one is quite good. The phone is big and light in weight, if you wear tight jeans like me than you may face difficulty to hold you phone in your pocket specially on bike and sitting on floor, But I learnt to manage it. If you’re in wedding or travelling than HTC One X camera is enough to shoot beautiful moments. Camera is not as good as HTC advertise but I bet you that its better than other smartphone out there. You may disappoint with the filters come with the One X camera but don’t worry we’ve good many app available in the play store to deal with it. If you’re music fan than you’ve to pay 2K more to get Beats Audio headphones. HTC One X comes with normal earphone which is good for people like me who listen the song for timepass but if you’re music lover than beats audio is must for you. I Must say you’ll never disappoint with HTC One X, the best phone Android phone with awesome build quality, beautiful UI and authenticated camera. I fall in love with my One X and called my device “The Quad-Core Beast”.